One brutal Polish winter in an unspecified year during World War II, three German soldiers embark on a mission they dislike because remaining in camp would require them to do what they like even less. Emmerich, Bauer, and the unnamed narrator evade their despised lieutenant, a self-important martinet, to go hunting one of “them.” If the trio brings their quarry back to camp, they’ll be spared having to execute those prisoners already collected. But if they pretend to have caught one and shot him or her on sight, the lieutenant won’t believe them and will be certain to assign them the mass killing duty, which disturbs their dreams and troubles their consciences. Since “one of them” means a Jew, A Meal in Winter is therefore a Holocaust novel, and an unusual one, at that. Not only does Mingarelli focus entirely on Emmerich, Bauer, and their unnamed comrade — the perpetrators — the author casts them strictly as men ordered to perform a task they hate, which poses moral dilemmas. The real sadist, therefore, is the unseen lieutenant, who has placed the three in their predicament. What’s more, they seem neutral, if not indifferent, to Jews, whereas a Polish civilian who happens on them is a vicious anti-Semite. Emmerich, Bauer, and the narrator are reservists, meaning they’re older men, and Emmerich has an adolescent son he’s worried about, an anxiety his buddies try to help them with. No Holocaust story I’ve ever heard starts from such a focus on individuals rather than mass actions, but that doesn’t mean A Meal in Winter couldn’t have happened. Mingarelli plainly wants as spare and simple a narrative as he can get, preventing the perpetrators from hiding in a large group. That approach works well in some ways, but others, not. When I turned around, there was smoke floating from the chimney. The sight lifted my heart. Added to the fact that we had avoided the shootings and that there had been no wind since the morning, it was no exaggeration to say that this had been a good day. And of course Emmerich’s sharp eyes [which had spotted their captive] had made it an even better day, for tomorrow we would undoubtedly avoid the shootings again, if there were any. Bringing one back meant we would have the right to go out searching again. Nobody would be giving us evil looks…. Unlike today, we would even be able to wait for the kitchen to open so we could get our rations. We would be entitled to all of that tomorrow. So far, so good. 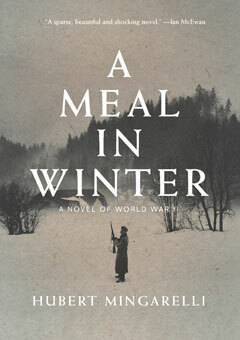 A Meal in Winter is a haunting novel, to be sure, a razor-sharp moral tale that attempts to explain how men caught up in a heinous crime contribute their share of it. Mingarelli, a writer of great subtlety, never lets his characters soapbox; like most soldiers, they’re largely inarticulate, especially about feelings. So it is that when Emmerich frets about his son at home, and whether the boy will take up smoking — what the soldiers do plenty of — I read that as his prayer that his son will never have to hunt and kill anybody. But there’s one problem with A Meal in Winter. Emmerich, Bauer, and friend are still killers, and they’re chasing down victims who pose no threat. They’re not fighting off Russian soldiers or Polish partisans; in fact, they’re not fighting at all, because the people they’re hunting have no weapons. Like most soldiers, these three concentrate on how to stay warm, eat enough, and get safely through another day — but that program requires them to murder innocents. Consequently, they’re unsympathetic — at least, to me — and if I’m supposed to be impressed that they tell the anti-Semitic Pole to quit foaming at the mouth, forget it. Conversely, if Mingarelli wants to show how these men kill without malice or conviction, you could argue that’s even worse than if they were die-hard anti-Semites. Granted, a key strength of this novel is how Mingarelli leaves plenty of space for the reader to slip into the story and ask, “What would I do in this situation?” But though I understand the soldiers’ plight, which Mingarelli describes in remarkably few yet vivid words, I can’t call them victims, care about them particularly, or identify with them; they’re moral placeholders, no more. Nevertheless, as a moral exercise, A Meal in Winter will challenge readers, and there’s much to be said for that. This slim novel won’t take you much time — I spent longer writing this review than I did reading the book — yet I’m confident it will stay with you. Disclaimer: I obtained my reading copy of this book from the publisher via Historical Novels Review, where this commentary appeared in shorter, different form.